Workers removed the last of three bodies from their icy grave near the top of Oregon's Mount Hood Friday a day after the worst climbing accident in the region in 16 years. The mountain was closed to all climbers, and the Air Force was looking into what caused one of its rescue helicopters to crash on the mountain as it was retrieving one of the six climbers who survived. The Pave Hawk helicopter was attempting to bring up a climber on a gurney attached to a cable when the craft plunged into the snowy peak Thursday afternoon. It rolled over half a dozen times, throwing crewmen into the snow as it tumbled 1,000 feet before coming to rest upside down. Six crewmen were injured, one seriously. Rescuers praised the crew for steering the helicopter away from people who had gathered on the ridge to help survivors. "He banked left to keep from hitting us," rescuer Mike Leming said of the pilot. "He knew he was going to kill us so he just started moving out of the way." A crew member released the cable just before the helicopter lost control. An injured climber and three rescuers who were assisting him were on the gurney, which was still on the ground when the cable was released. The climbers fell into the crevasse around 9 a.m. Thursday, when one group of climbers slipped as they ascended the state's highest peak. The accident, which occurred about 800 feet below the 11,240-foot summit, triggered a chain reaction, as the tethered climbers slid into another group of climbers below them. Those climbers then crashed into the next group, and everyone tumbled into the crevasse, said Cleve Joiner, an uninjured climber who called for help with his cell phone. "The only thing I can compare it to is hockey players who throw themselves on the ice to block a shot," Joiner said. "Everybody was sliding on the ice, and then they disappeared." Joiner, the assistant fire marshal at the Tualatin Valley Fire & Rescue department, was one of five people from the department who were climbing. His 14-year-old son, Cole, was among those who fell in the crevasse, but he wasn't seriously injured. "When I found out he was alive, it was an emotional moment," Cleve Joiner said. "I just kind of fought back the tears and carried on." Cole Joiner, a rescued climber, told CBS News on Friday: "The fall was quick … I didn't have time to think about it. It was an eerie feeling." The helicopter crashed about five hours after the accident, shearing off its rotor. At least three crewmen flew from the helicopter as it rolled down the slope, and the craft appeared to roll over one of them. "We heard a big bang," said Dave Mull, a member of American Medical Response. "It was silent, as if it was all happening in slow-motion. The next thing, everybody was on radios, yelling that a bird went down." 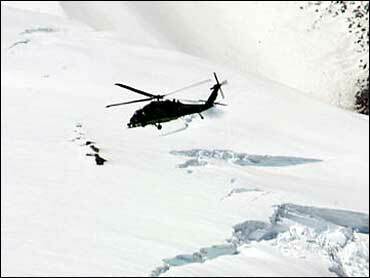 By late evening, all the injured climbers and helicopter crewmen had been taken off the mountain, said Sgt. Nick Watt of the Clackamas County Search and Rescue team. The bodies of two of the climbers who died were brought down Thursday night and the third was recovered Friday. One member of the helicopter crew was hospitalized Thursday in serious condition; the others had less serious injuries. Pave Hawk helicopters can operate at altitudes up to 14,200 feet. It is a modified version of the Army's Black Hawk helicopter used for search-and-rescue missions. The helicopter that crashed was assigned to the Air Force Reserve's 304th Rescue Squadron based at Portland International Airport. An Air Force safety team has started investigating the helicopter accident and debriefing the crew, Air Force Reserve Maj. Anna Sullivan said. In the past 100 years, there have been 130 deaths on Mount Hood, which is popular among climbers of various skill levels. Some 40,000 people fill out permits to climb it every year, and the route taken by the climbers Thursday was particularly well-traveled. Mount Hood was the site of one of the worst climbing disasters in the United States. In 1986, seven teen-agers and two teachers from the Oregon Episcopal School in Portland froze to death while retreating from a storm during an annual climb by students and staff.